Our hostess this week is Dymphie Meeuwissen – it is also her birthday! 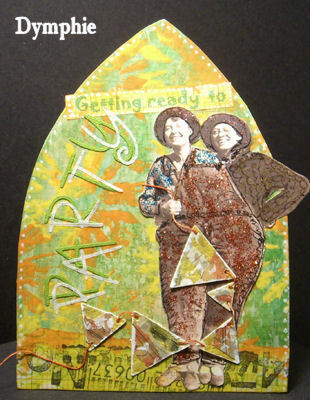 Dymphie selected the theme “party” for this weeks challenge – how perfect could that be? She created this adorable and whimsical arch that is so perfect for our theme! What do you think of when the word “party” comes to mind? fun with family and friends? lots of presents and cake? whatever your inspiration is we hope you will share it with us in the form of a gothic arch! overdonderd. Het thema dat onmiddellijk naar boven kwam was: “Feest!”. jaren. Dank je wel Nancy! bezig te zijn, het is heerlijk rustgevend precies werk. You may visit Dymphie’s blog Papier Avonturen to see more of her beautiful and inspirational artwork! Happy Birthday Dymphie … hope you’re enjoying your special day!!!! For this challenge I use fabric, stamps and a image. For this challenge I used fabric, stamps and a image. happy birthday dymphie! its my birthday on friday as well! Happy Birthday! Celebrate life everyday! Happy Birthday for you, Dymphie. Have a nice and happy day. Happy birthday wishes to you, Dymphie! What a grand celebration! Happy, happy birthday Dymphie. I hope you have been partying with family or friends (or both!). Hope you’re still partying Dymphie! Here’s my arch……..
Hi everybody. Happy Birthday, Dymphie!! I thought I’d have a tough time with this theme, but I had fun with it. Here my entry for this week. Happy Birthday Dymphie! This is my first time playing with Gothic Arches, but this is what I made to help you celebrate! Here is my arch with thanks to Dymphie! happy birthday Dymphie!!! and thanks for this great theme! happy birthday to you!!! Here some birds singing your birthday! Bit late but made it! Hope you had a fab birthday Dymphie! Hope you have a great party. Here is my party arch for you. Happy Birthday wishes to you Dymphie! I hope you had a wonderful birthday week! Here is my arch for this week’s challenge….make a wish! I just uploaded my “Let’s Party” arch-thank you! A little late, but I still can celebrate. Hope you had a great Birthday Dymphie! Hi everyone – I really struggled with this theme for some reason! Eventually though an idea developed.. Here is my contribution for weeks 5-8, all in one big post! !